Distinguished bass/baritone singer Christopher Purves has long been a mainstay of the opera and concert stage. His broad repertoire perhaps evidenced by the fact that my last three reviews of him were in operas by Mozart, George Benjamin, and Georga Enescu. On this occasion, he was the focus of the evening. But this wasn’t one of the usual, and rather predictable, ‘star singer and backing orchestra’ events. 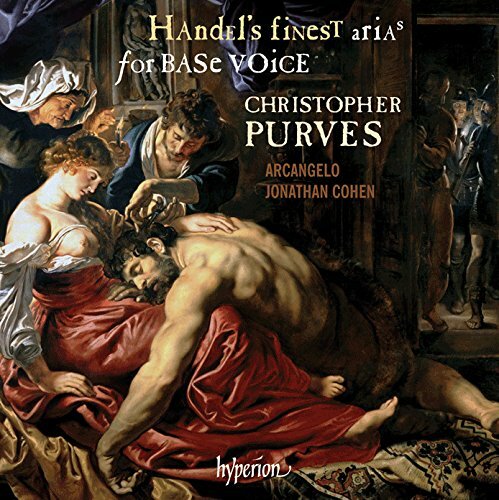 Purves and Arcangelo shared the honours in a well-planned partnership of vocal and orchestral music. Purves remained on stage throughout, sitting at the side during Arcangelo’s moments. His jovial introductions to the pieces were relaxed and approachable, not least his opening comment that we were about to hear music for some “complete and utter bastards as well as a couple of real sweeties”. Although many of the protagonists in the programme were clearly in the former category, there were enough of the latter to bring some relief to the bluff and bluster of many of Handel’s music for bass. Christopher Purves has an enviable ability to sing the most complex musical lines whilst retaining perfect diction, absolute clarity of articulation, and a beautifully stable voice with minimal traces of the vibrato that bedevils so many singers. He also managed the sort of low bass notes that most singers can only manage before breakfast, notably in the gorgeously gentle ‘Fra l’ombre e gl’orrori’ from Aci, Galatea e Polifemo. Added to this his outstanding communication skills and his evident ability to absorb and channel, on this occasion, a wide range of different characters – eight in total ranging from Argante, Cosroe and Gabrias via the two different version of Polyphemus/Polifemo to the concluding Hamon, in Esther. My only slight quibble is his habit of turning initial ‘R’s into machine-gun like ‘Rrrrrrrrrrrrrrrrrrr’s’. Having said that, two of those occasions were perfectly apt – ‘I rage, I melt, I burn‘, from Acis and Galatea and ‘Racks, gibbets, sword and fire’ from Theodora. The always excellent Arcangelo produced several instrumental highlights, the finest also being the most entertaining with Rebecca Miles’s recorder playing in I rage, I melt, I burn. Handel pokes fun at Polyphemus by interpreting his request for “a hundred reeds of decent growth” to make a pipe “for his capacious mouth” with music for the tiniest of recorders, on this occasion whipped from Purves’ inner pocket and passed over to Rebecca Miles to replace her larger version. During ‘Opprest with never ceasing grief’ from Belshazzar, Katharina Spreckelsen added some delightful oboe moments. In their performance of two Handel Concerti Grossi (Op6/5 and Op3/4), leader Cecelia Bernardini and fellow violinist Michael Gurevich and cellist Jonathan Manson excelled. On the down-side, the theorbo player was rather disturbingly anarchic in his use of off-beat rhythms and inappropriately percussive twangs and strums. My only issue with the programme is that it was a shame that, instead of the two performed Concertos, we didn’t hear a couple of Handel’s Organ Concertos, not least because they were first performed during the intervals of some of the oratorios that featured in the programme. It is debatable whether Handel included an organ in his operas, but certainly did in the oratorios, although on this occasion the organ was played throughout, although it was only audible (at least, to me) on one occasion. That said, the two Concertos played were very effective examples of Handel’s instrumental composing style – and his ability to confuse audiences as to when a piece finishes. The lack of a listing of the movements in the programme resulted in two rounds of applause in the ‘wrong’ place, despite director Jonathan Cohen’s attempts to indicate that the piece had not ended. An inspiring concert. The concert includes pieces from the Hyperion CD Handel’s finest arias for Base Voice. A second CD will be released later this year.